As immigrant-skeptic movements gained salience, and even political representation, in several European countries in recent years, Germany remained a relative outlier. From 2005 onward, even as the country experienced a major rise in immigration, leaders across the political spectrum maintained a consensus in support of continued immigration and emphasized the importance of maintaining a culture that is open to newcomers and diversity. While that consensus has been put to the test as Germany copes with massive inflows of asylum seekers and migrants that began in late summer 2015, it is instructive to see how the consensus developed. This Transatlantic Council on Migration report examines the 2005-15 period to provide answers, finding that Germany's pro-immigration consensus was built on a foundation of economic growth, linkage between immigration and economic growth in public narratives, steady migration flows, and high investments in integration. That foundation likely safeguarded the country from political and public turmoil during the initial months of the migration and refugee crisis. 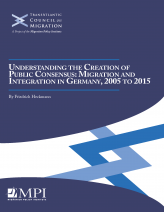 The report, which examines factors behind the pro-immigrant climate as well as challenges to the consensus in the form of populist anti-immigrant movements and other developments, traces the steps that political and business leaders, the media, and civil-society organizations took during the decade beginning in 2005 to establish and strengthen “a welcoming culture” to make Germany more attractive to talent from abroad. It also examines the eroding consensus and policy responses. IV. The Current Migration Crisis - Cracks in the Consensus?